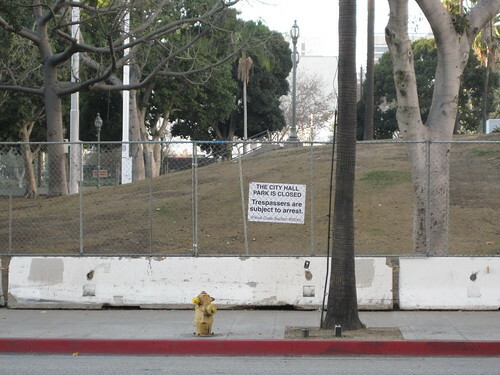 The south lawn of City Hall after the eviction of Occupy LA. 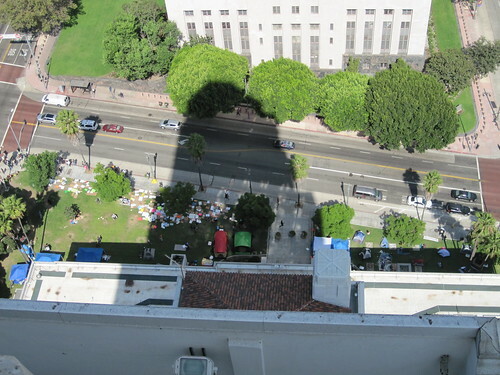 What is it about the south lawn of City Hall that brought the Occupy Los Angeles movement there? Was it just a coincidence, or is there more to this location than meets to eye? 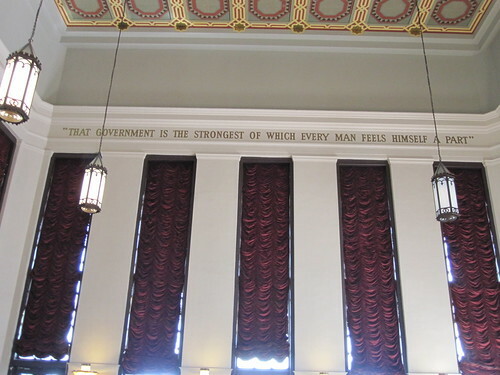 “THAT GOVERNMENT IS THE STRONGEST OF WHICH EVERY MAN FEELS A PART” – inscription on the ceiling in the Hall of Mayors at City Hall. When you want to be a consumer in Los Angeles, you can go shopping. Our city is the crossroads of manufactured goods from the East as they pass through our ports and head into the heartland. Nearly anything made or consumed on earth can be acquired in this city, at thousands of retail shops, stores, and malls. When you want to be a student, you can go to school. Los Angeles is home to thousands of schools of all kinds of varieties, some public and some private. The breadth of schools is amazing: esoteric religious philosophy, law, science, arts of all kinds. You name it, we have it. When you want to be an athlete, you can join a private team or go to a public park. The number of athletic activities at both the professional and amateur level are so profuse and diverse that to describe even a fraction of them would fill several volumes. So, what is the deal with the Occupy Los Angeles movement on the lawn at City Hall? Why did these people feel they needed to sit outside for weeks and weeks on a lawn when the riches of the world and of the entirety of human civilization literally sat at their fingertips? I think it boils down to this: in Los Angeles, when you want to be a citizen, to talk openly about the issues of the day, where do you go? It is easy to find voices talking to you in Los Angeles: the TV, radio, internet, and public speaker series abound. Where does one go to be listened to, in turn? We have become so atomized here that for most of us, the answer to this question is deeply personal. It could be that we are listened to in our church or an inner circle of friends. For most of us in Los Angeles, it is likely that the true answer is: nowhere. There really is nowhere that most of us are listened to. Why? We are a city stuffed full of intellectual heavy weights, captains of various industries, artists of the highest caliber, mass media makers. For these folks, finding an audience is trivial – they preach to choirs in their classrooms, boardrooms, theaters, and museums. For the rest of us, where do we go? What do we have? Occupy LA sign making area in the shadow of City Hall, October 2011. We used to have a park. In Los Angeles, Pershing Square was the place to be for people that wanted to spout opinions, argue ideology, taste, and religion openly and without the barriers of respect or reverence mandated by other, more formalized, systems of public speech. Eric Richardson of blogdowntown wrote a story about the death of public speech in Pershing Square on February 09, 2010 in a post entitled “The Great Debaters of Pershing Square“. In summary, Mayor Sam Yorty saw to it that Pershing Square was turned it into a “walk-through” park in the 1960’s. His desire to quash the Pershing Square Philosophers was the main reason for the retrofit and re-designation of the park. Yorty’s work is in line with the de-urbanization movement of the 20th century, in favor of the government backed growth of car-only suburban sprawl and degradation of the urban core. Behold, the purple broken-Lego tower at Pershing Square. The spiritual death of Pershing Square was completed with its most recent retrofit, a $14.5 million hack job done in 1992, as a broken lego dumping ground, complete with hidden hobo pissoire corners, indecipherable entry points, a private security force, and safety-coned pond (pigeons only!). LA, by this time, had reached one of its lowest points – taking an animus towards city life and the interests of its residents to an extreme level. The civil unrest of 1992, followed by a series of large-scale natural disasters, helped to re-awaken a sense of shared enterprise. Towards the mid 1990’s, generational turn-over in departments put more ethnic minorities in charge of day-to-day operations, won them political office, and helped create a movement toward good governance. 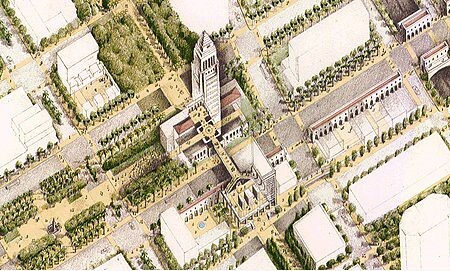 Rendering of City Hall surrounded by parks from the 1997 Los Angeles Civic Center Shared Facilities and Enhancement Plan. 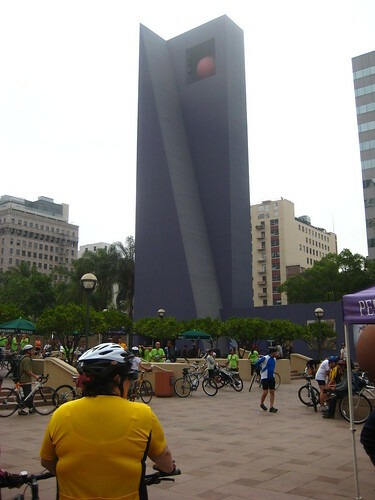 In 1997 the City of Los Angeles released the Los Angeles Civic Center Shared Facilities and Enhancement Plan featuring a grand plaza on the location of the old CalTrans building across 1st Street from City Hall. Many in the downtown community assumed that when CalTrans moved into their new headquarters (just across Spring Street from their old headquarters) that the plaza would be installed. This new civic space would become, in essence, an extension of the lawn and steps around City Hall and would most likely fulfill the needs left unmet with the degraded Pershing Square. Around the same time that CalTrans was moving into their new building, and the site of their old one was being turned into a flattened dirt field, the LAPD’s search for a new home had been dragging on for years. 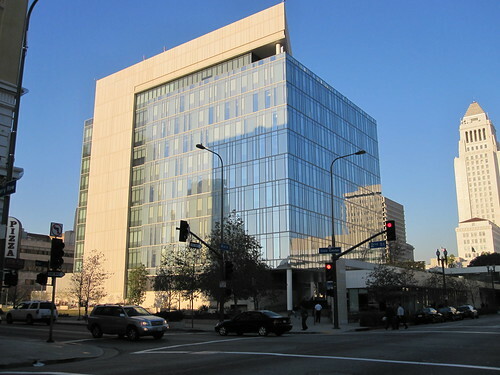 LAPD’s new building on the former site of the CalTrans building. This site was planned as “open space” when the city gained control of it. Jan Perry, and others, worked hard to get a shining new building for LA’s biggest General Fund expenditure – law enforcement. “Three years ago, the City Council did approve a plan to make the entire block into “open space” as part of a land swap with the state. But Perry said Monday the city never committed to a park. LA was going to have a real central park until Jan Perry fought to make it Buck Roger’s Gulag of the 21st Century. Pershing Square in ruins, a public square replaced with a police headquarters, the people of LA really had nowhere of significance left to go to exercise their free speech, unfettered by entry fees, decorum, or a PA system. In 1988, the movie “They Live” used the south lawn of City Hall as a stand-in for Pershing Square. The movie is a cornball space-alien conspiracy flick, one in which greedy capitalist aliens have enslaved the human race with advertising and the use of strong-arm police tactics. The central thesis of the film is actually a pretty close approximation of how people in the Occupy movement feel about our situation. Robbed of a commons in the service of elite fears of unrestricted public space and law enforcement (the single largest expenditure of city funds), Occupy LA did as the makers of the 1988 film “They Live” did: they used the lawn at City Hall as a stand-in for a town square. Democracy needs a commons, with Occupy LA the people made one. Let’s hope they don’t run out of bubblegum.